With Kristina Halvorson’s Master Class coming up soon, I’ve been looking for interesting examples of content strategy at work in higher education. When I saw that the University at Buffalo was looking for a Content Strategist, I had to learn more about their plans and initiatives. According to David Anderson, Director of Strategic Digital Communications at the School of Medicine and Biomedical Sciences at the University at Buffalo, the Web Content Initiative at UB took advantage of the desire to get a CMS to dramatically improve website practices. Three university departments (IT, UC, and the School of Medicine and Biomedical Sciences) partnered on this project. So, while this wasn’t a pure Content Redesign, it definitely fits the bill of putting a major focus on content. David was kind enough to answer a few of my questions so we can all learn more from his experience. 1) You mentioned that you used Indi Young’s work for this project. Can you tell us a bit more about it? Why do you find it relevant to the situation in higher education? We employed the techniques from Indi’s book Mental Models in developing our overall site strategies. We developed mental models and gap analyses for a our audience segments. If you’re not familiar with her work, one of the outcomes is a very long chart that aligns content/tasks with audience goals. Crucial to the process is interviewing your audiences. I’d liken it to personnas on steriods. The resulting chart provides a very striking, visual guide to where you’re meeting audience needs/task and where you aren’t. Here’s an example. Knowing the tasks and goals of our audiences informed our site designs. We only work on content/tasks that align with our audience needs. 2) How have you used Kristina Halvorson‘s tactics to revamp your websites? Can you share some specific examples of what has proved to be the most useful? Each of the project partners performed content inventories/audits on their sites at the very start of the project. Those inventories helped us in building the mental models and in identifying what content needed to be developed. We tried to move very quickly through this project, bringing additional techniques along the way. By our second site, Eileen Ruberto (our IA) was able to pull together a strategy guide that included page tables for every page in the site. Those were a tremendous help: they provide page-level guidance on what content belongs on the page, the messaging goals, related content, et cetera. All four of the School of Medicine’s pilot sites are now in production and we are working on the rest of the sites in the school, using these practices. 3) Content strategy looks like a daunting task, any lessons learned from this project you can share? It certainly can be daunting. It’s not to be undertaken lightly. And you need resources. For smaller sites, it’s possible for one person to do it all. But for larger sites and organizations, you need a depth of expertise. Halvorson’s book is invaluable in demonstrating that. If I had to pick one thing as the single most valuable product to come out of the process, it’d be the page tables. I’ve worked on many website projects and the biggest challenge I’ve seen people struggle with is knowing what to write in the context of an individual page. The page table is terrific: it tells your writers exactly what needs to be on the page, how to say it, and what supporting materials need to go along with it. Practice on these strategies on a few small sites first. You need to figure out how to make these strategies fit your practices and workflow or learn to adjust appropriately. The first time through is a rough ride but it becomes a lot easier. And the lack of good tools to implement these strategies is a big problem. Wonderful look at the nuts and bolts of the work our team has done at UB. And we are thrilled to see a lens on how we positioned our work in the Medical School. • Care for the site in a sustainable manner. And create select effective pages that are stewarded regularly rather than many pages that are not effective nor cared for. • Indi Young was on our team as a consultant to our project and worked with the “innies”, our UB information architecture team (a collaborative team of which Eileen was a part of) and the “outies” (a team from mStoner), to develop the mental models that informed the project. • mStoner collaborated with our UB team to develop the information architecture, fundamental messages and key user tasks that informed the content strategy. • Without strategically positioned content and a smart interface, a cms is just a faster way of loading poor content onto the web. The key deliverable to our project is creating best practice prototypes of different kinds of UB sites (academic, administrative, and service-oriented) that will be used to inform web development by all the units at UB. From our work we are deriving leveraged templates for User Interfaces and Information Architecture, content strategies that inform content development and shared content that can be leveraged across UB, as well as informing the set up and functionality of our CMS. 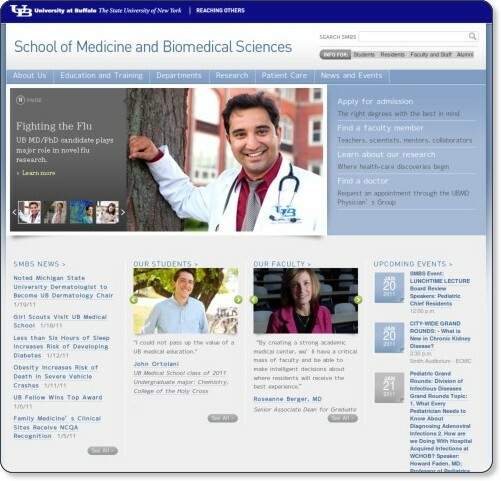 • Some of the other sites using this thinking are: President site (http://www.buffalo.edu/president) and coming up are our strategic vision (UB 2020) site, our giving site, the UB Information Technology site and the UB home page. And soon (hopefully) all the sites in the university. Nice article, interesting project, and the sites look great. It has me wondering about the use of page tables vs wireframes. I’ve found that, just as we have different types of learners, we have a need for different ways to demonstrate what will be on a web page. Some folks can work off a simple text description while others never really understand what will be shown until the full design has been coded. Can you speak to how page tables are an adequate replacement for a wireframe for clients who are visual learners? Were there decision makers at UB who had a difficult time “getting it” with the page table process? This is a great question Ben. What helps a lot is that we are involving the site authors and “owners” in developing the information architecture. We find presenting information in stages helps with “digestion”. Our authors collaborate with us to identify the key messages, the user behaviors and needs from the mental models we built, and the key audience needs. We present our final output as IA (outline form) and wires so they can visualize how the site “real estate” will be allocated. Once we get buy in, we then aggregate everything into our content strategy page tables. This is not so much for presentation, as it is to create a document that authors can reflect their work against both when they create the content, and when they are looking to update it. Our inspiration for working with the page tables was to be able to codify our strategic thinking as a reference for an author working in a just in time way. Page tables aren’t a replacement for wireframes. They are guides for the writers to know what content goes on a given page (there should be a page table for almost every page in the site) and what messages are important, who the audiences are, etc.